MainAll NewsMiddle EastIDF withdraws, PA cuts security coordination? IDF withdraws, PA cuts security coordination? A mere day after reports of IDF withdrawal from Area A, PLO to debate a complete end of security coordination with Israel. 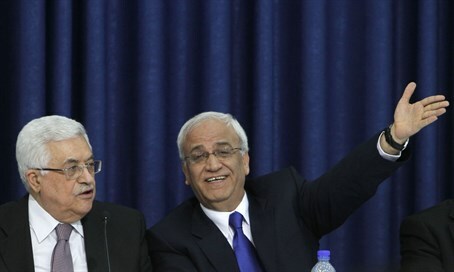 Saeb Erekat, Secretary-General of the Palestine Liberation Organization (PLO) and former chief negotiator with Israel, is set on Wednesday to raise a proposal to completely end security coordination with Israel at the PLO executive committee. Palestinian media reports that the PLO executive committee discussion today is critical to the future of relations between Israel and the Palestinian Authority (PA). "We will meet to officially approve an end to the security meetings with the Israelis and we will stop the security coordination with Israel," said Erekat. "This position was accepted after we received a clear answer from Israel regarding its lack of commitment to signed agreements and its intentions to continue its invasions into Palestinian territories," he added. Interestingly the discussion is being held despite reports by Channel 10 on Tuesday night, according to which the IDF has partially withdrawn from Area A, regions in Judea and Samaria designated as being under PA security and administrative control by the 1994 Oslo Accords. The IDF was forced to reenter the regions due to the 2000 Oslo War or Second Intifada so as to quash the rampant terror. This is in fact not the first time the PA is threatening to end security coordination. In early March a delegation "officially warned Israeli authorities" that it would end security coordination. PA chairman Mahmoud Abbas threatened to end security coordination in a speech at the UN General Assembly last October 30, and similar threats have been issued countless times by PA officials. The unwritten agreement between Israel and the PA appears to allow the PA to carry out rampant murderous incitement against Israel, as long as it cooperates with Israel on other levels. As a result of the PA's incitement, a terror wave has been sweeping Israel since last September and has claimed the lives of 34 victims.